Quilt 'n Sew Studio is a full-service authorized Janome dealer. We are very proud to offer sewing machines from Janome. These top-performing machines are reliable workhorses that have won awards for their superb design. 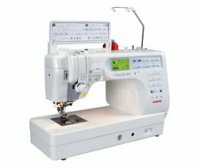 We carry Janome sewing machines for all budgets and sewing interests, from our sturdy "starter" machines, all the way up to the state-of-the-art sewing/embroidery machines. We stock Janome feet & accessories. Because we want your sewing experience to be successful, included with your purchase are classes to guide you through the many wonderful features of your new machine. And to keep your machine humming along, the first annual cleaning is complimentary! Come on in and test-drive these wonderful Janome machines to find out what everyone's talking about! The Janome web site is a wonderful resource for product information, lessons, service, & support. They have hundreds of projects, excellent lessons for specialized sewing techniques and for their software updates, free embroidery designs and much more. Visit www.janome.com often to see what's new and to join the Janome online mailing list. Below, we have highlighted just a few of the most popular Janome machines. For a complete list and details of what Janome has to offer, please click here to review their full line of machines. If these machines are not in our store, we will be able to order just the machine you want!